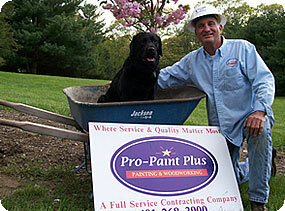 At Pro-Paint Plus, Inc., we strive to be the best. We use only the highest-quality products in our remodels, and only fine interior and exterior paint. As a full-service contracting company, we do it all, from start to finish. We can handle any unforeseen repairs needed, along the way. And, because we’re your neighbors, we’ll be here to serve you throughout the project, and for years to come. The way you are treated as a client is important to us. Our track record reflects our level of courtesy and caring for our clients’ opinions and concerns on all matters of their project. We will take the time to stop work, and explain “why it is necessary” and what will happen, as a consequence of the construction practice used. We have competent people on all work sites that know the total sequence of the scope or your project, and are willing to explain, so your experience on your project is pleasant and gratifying to assure successful expectations. Many new products seem to be the remedy for construction and remodeling, but fall short and become problematic, when used in the wrong construction context. We have many experiences where removal of the “new products done by others” is the only solution, fixing a project that has gone bad due to new product promises. Our expertise has much depth in new and old product relations, and we are always conferring with manufacturers on the latest and greatest products, and how it will benefit any construction application. Our business is considered a serious matter, when it comes to the best application for your project. step-by-step application process, so the customer understands why the advice and direction that we are going in will benefit the process procedure and the best possible results for their project. Proving to the customer that “what we said is what will happen” is a proven track record, time after time, with our cliental. Ask our references about this experience, and you will come to the conclusion, that our “word” is our promise. We are detail-oriented in our construction practices. As you will observe, our work will look, as though it is “text” that came out of the construction manual. We are noted for our attention and following the schedule, agreed to with our clients. If the client has any reason for a schedule change, we will consider it very important to arrange the schedule to fit and maintain balance with other work in the pipeline. We are very considerate for last minute changes, and work diligently to keep all schedules realistic and balanced. Our sales staff usually will have an estimate for you within five working days. Some estimates will be quicker or longer, depending on the size and scope of the project. Note that each estimate will be taken seriously, and then returned in a timely fashion, at a scheduled returned proposal meeting. The client will then have an opportunity to ask the pertinent questions, regarding their project. All projects carry a full-year warranty, bumper-to-bumper, if any project fails.